If you've ever visited a climbing wall with your kids, you probably know how fun it can be. Well, now you can take that fun home by making your very own climbing wall. I'm going to go over all that you need to know to make your own climbing wall in your backyard. Safety always comes first, even if your rock wall is short. You should always make sure you installed the rock wall correctly, and that your children are using it correctly. I'm going to go over some safety tips that your child should always follow. When your child is climbing the rock wall, you should always be there to watch. If you are unable to watch, have another adult watch your child. Even if your child is older, you should not leave him or her alone to climb. If your child does fall, it is important that he falls on a soft surface. A mat is a great option. If your rock wall is really big and tall, a mattress may work better. Anything that is soft will work. In case your child falls, you should dress your child in a helmet. This is especially important if your rock wall is high. To prevent injuries while you are not around, you should block off the rock wall. This can be done by attaching mats to the wall. If your child doesn't know how to climb a rock wall, you should teach him how. Not only will this be a good skill to know how to climb, but it will also prevent your child from falling. Flip-flops, sandals, dress shoes, slippers, and any other shoe without a good grip should not be worn when rock climbing. Before your child climbs, make sure his shoes are good to wear. And if you don't see any shoes on his feet, he shouldn't climb up the wall. Climbing barefoot may increase his risk of slipping. 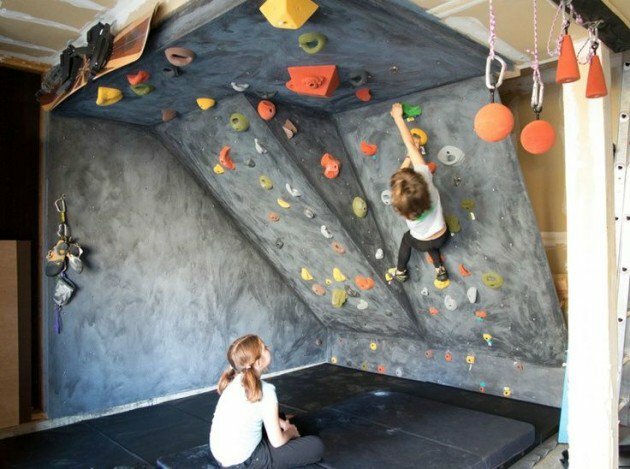 There are many ways to make a kids rock climbing wall. Before you start building a kids climbing wall, decide if it will be an indoor climbing wall or outdoor climbing wall. I'm going to go over both types of kids rock walls, so that you can decide which type will fit your needs. So, let's get started on learning how to build a rock climbing wall. Building a climbing wall indoors is very easy to do. Begin by finding a spot where a climbing wall would fit best. Make sure that area has plenty of room for your kids to climb up and down. The area doesn't have to be too wide, unless you will be having multiple children climbing at once. The main focus when building a climbing wall should be to have lots of room to climb straight up. If you have a low ceiling, it may be harder for kids to climb. Start making your kids rock wall by drawing a picture on a piece of paper of what it should look like. By sketching before you start building, you are less likely to mess up later on. You can also find a program that will sketch for you. To find such a program, look on the internet. Cut the plywood into smaller pieces. Make them any shape you'd like. To make your DIY kids climbing wall more creative looking, you may want to cut each piece of wood into a different shape. Now it is time to screw the rock climbing panels to the wall. Make sure you hit a stud. You may want to use a pencil to mark where the stud is, so that you can screw the panel directly into the stud. It is best to pre drill your wall, just so you know the wall wood won't crack. Once you have installed the rock climbing panels, you can attach the climbing blocks to them. Make sure you space them out correctly. If you have toddlers, the climbing blocks will need to be closer together. Have your kids test the rock wall. Does it hold their weight? Are the climbing blocks spaced correctly? Can your child easily reach each climbing block? Make minor adjustments if needed to this DIY rock wall. Enjoy watching your kids climb up and down, and if it can hold your weight, try climbing it too! 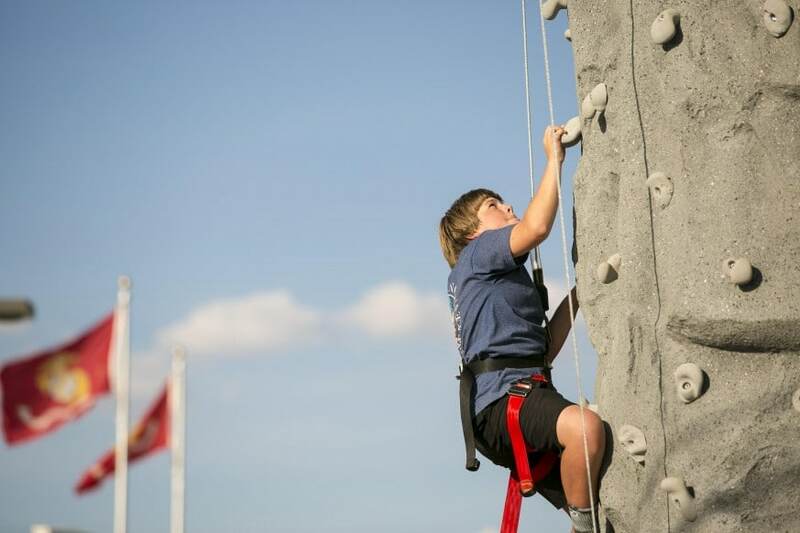 A kids outdoor climbing wall is a great activity for the summer. With the warm weather, your children will most likely want to climb outside rather than indoors. Before you begin building a homemade rock climbing wall, find a location that will be a good place to build it. The side of a house is good. 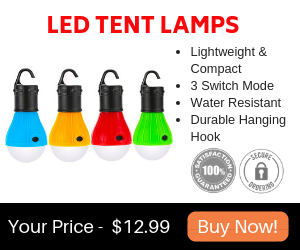 Or you may want to connect it to your child's playhouse. Decide where you'd like it, and then start building. Start making this very easy DIY rock wall by screwing the wood board to the side of your house (or playhouse, fence, etc.). 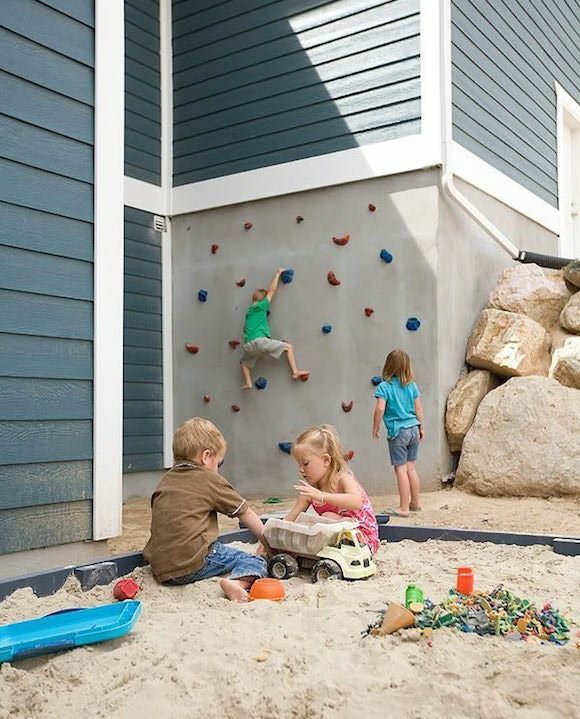 If you want to make this kids outdoor climbing wall very simple, you can skip this step. Attach the climbing blocks to the wood. If you decided to not use the wood, you can simply screw the blocks directly onto the house. Let your kids try this rock wall out. Make any minor adjustments if needed. Before you start building a DIY rock climbing wall, you should consider some things. These considerations will help you get an idea of where you want to build your DIY climbing wall. I'm going to go over some questions you may want to ask yourself before building a kids climbing wall. How Young Is Your Child? Consider the age of your child before you start building a kids climbing wall. 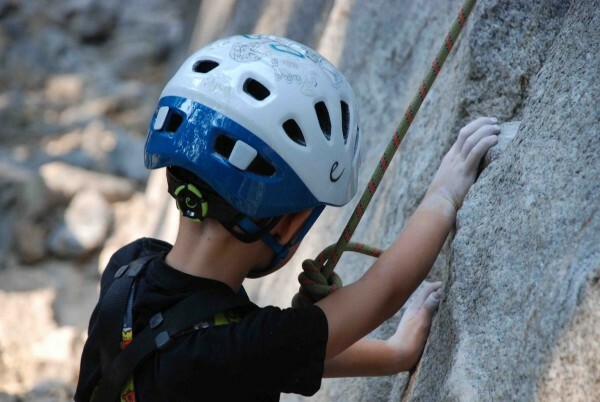 Is your child old enough to handle a large rock wall? If your child is young, you may want to make a toddler climbing wall. A rock climbing wall for toddlers would be smaller than other climbing walls, and some come assembled already. All you would need to do is find a spot you'd like to put it. If your child is very young, you may want to consider purchasing a baby rock climbing wall. A baby rock climbing wall is usually soft, so that your baby won't hurt himself. Decide if you want a DIY indoor rock climbing wall or a DIY outdoor climbing wall. If it is inside, you will need to install it to your wall. You may be able to get pre drilled climbing wall panels, which will make installation easier. If you will be installing the kids climbing wall outdoors, you will need to attach the panels to an outdoor wall, such as the side of a house. Do You Want to Purchase a Rock Wall Kit? For some, building a children's rock climbing wall by themselves is just too much. That's where a home rock wall climbing kit can come in handy. Some kids rock climbing wall kits will come in the form of a molded plastic rock climbing wall. 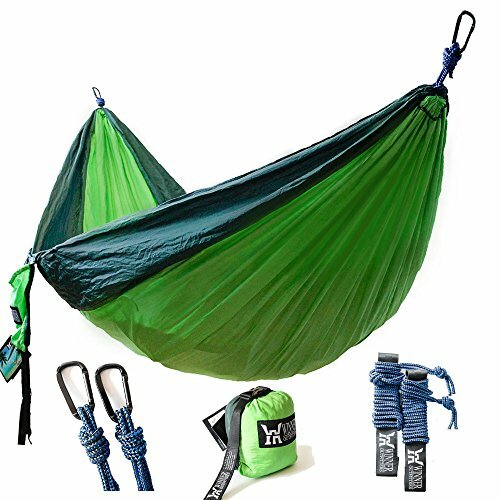 This type of kit can look as though you were at children's climbing gym. Do You Want to Build a Kids Climbing Wall, or Go to a Nearby Climbing Gym? Although a backyard climbing wall or indoor climbing wall isn't too expensive, some people may not want to build their own. But if you still want to have your kids enjoy rock climbing, you may want to take them to a rock climbing gym. One popular gym is the ABC climbing gym in Boulder, Colorado. The ABC climbing gym is a kids climbing gym that allows kids to learn how to climb a wall. Learn more about the ABC climbing gym by clicking here. You can also search for more kids climbing gyms near you by searching on the internet "climbing wall near me". Where Do You Want to Build It? Although we've already discussed about deciding if the rock wall should go indoors or outdoors, you will still need to decide where a good location would be. Some people have installed their rock wall in the bedroom so that that their child can spend time in his own room climbing. You may want to install the bedroom rock wall close to the bed, so that your child can fall on the soft mattress if he were to fall. 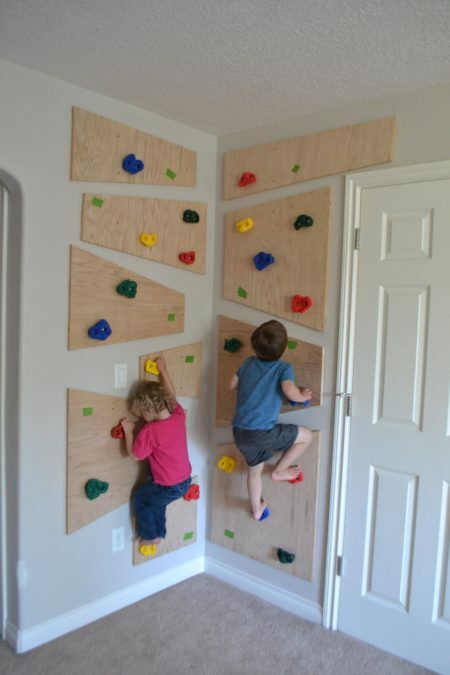 Another great place to install a kids climbing wall is in their playroom. 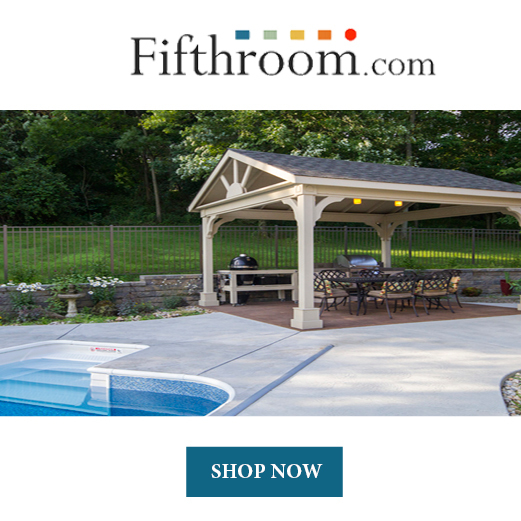 You could also connect it to a playhouse. What Position Do You Want the Rock Wall to Be At? Are your kids old enough to be challenged to climb sideways, upside down, or at a tilt? If so, you may want to tilt the rock wall slightly. This will force your kids to work harder. If your ceiling is strong, and you have a mat underneath it, you may want to have part of your rock wall be on the ceiling. If your kids are young, you may want to stick with making a rock wall that is straight. Remember that if at any point your child seems frustrated that he can't climb the rock wall, you should make it straight. Rock climbing is suppose to be fun, and not frustrating. I've gone over everything that you need to know to make your own climbing wall. I've covered how to build an indoor climbing wall and an outdoor climbing wall. Remember to follow safety rules always. Have fun and invite some kids over to enjoy your new climbing place!